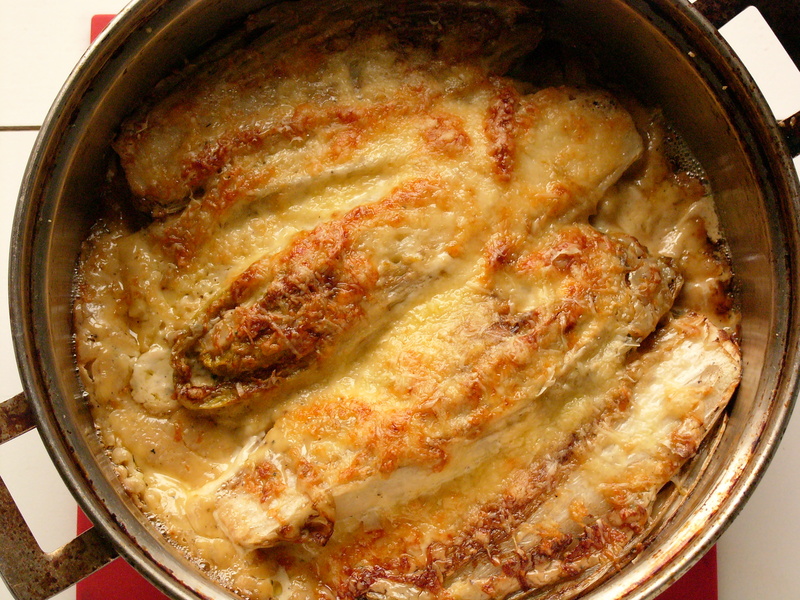 Clarke’s 30 Ingredients and baked chicory with cream and garlic | WTF Do I Eat Tonight? Every so often a cookbook comes along that blows me away. And, being a publishing type, to blow me away it has to tick a lot more boxes than the recipe one. Apart from at least five things I want to cook, I also want, in no particular order: tactile, heavyweight paper; exceptionally simple design that is perfectly in tune with the content; photography that reminds me how much can be done with light, glass and ingredients and lots and lots of expensive extras. A ribbon, or two, a cloth binding, preferably only on a bit of the book, and elegant endpapers. Finding all of these on one book, especially a cookery book, is rare. You may have noticed that publishing, book publishing that is, has been having a bit of a tough time recently and in tough times the pretty bits, that spot UV on the cover, the extra ribbon, the four-colour endpapers, well they all go. Which is a bit of a vicious circle: books start to look less attractive, not such good value and the customer starts to either a) buy them from Amazon (the lesser of two evils) or b) stop buying them altogether (the greater). So when a book appears that turns this pattern on its head, on all counts, and shouts ‘look at me, look at how beautiful I am, look at how brilliantly packaged all this fabulous information is’, well then I feel the need to share it and tell you all to go out and buy it. Such a book is Sally Clarke’s 30 Ingredients. From the minute I held this heavy, perfectly produced tome, all £25 of it, admired its racing-green quarter-binding, turned its crisp, firm pages and looked at its elegant photography, I knew this was a book that I was going to adore, for all the right reasons. First, the pages have LOTS of white space, not in a faffy, messed-about design way, but in a way that frames the recipes clearly, so reading them is not a constant process of dodging about between this heading and that, from one box to another. Second, the photographs are sometimes of ingredients, sometimes of a dish but, unlike some books, they are the right way round. So when you need a recipe photo, something to show you how brilliant something is, either to tempt you, or make you see something that might not be that obvious, you get one: open cep omelette with thyme and crème fraîche, for example, might not sound very exciting but the photo makes it look like the most perfect combination ever to grace a cast-iron pan. Elizabeth David would be proud. Finally, the recipes and their organisation are glorious. Sally Clarke has had a restaurant in London for the last 30 years and the title refers both to that achievement and to her favourite ingredients, most of which are vegetables and fruit; each one has a chapter to itself and in each chapter there are a handful of recipes for each. It may, at this point, sound far too tidy and controlled and, if that’s the case, then ignore these words, jump to the recipe and/or go and buy the book (it’s on special offer at £20 in the shop). If you’re still here, then let me tell you that, yes, there is something tidy and controlled about the recipes but for that you’ll be grateful. Because here are a hundred or so ideas, all beautifully presented but also all achievable. Apart from the things I don’t or can’t eat, there are perhaps a handful of things that I don’t want to make in the whole book. For most cookbooks, it’s usually the reverse. I knew it was special when the first thing I made from it was a pork and sage pie. I have never made a savoury pie, did you know that? Not one with pastry. And, though I know it’s dead easy, though I know it takes seconds, most shortcrust in this flat comes from a packet. This isn’t Wtfdoieattomorrow, after all, not often anyway. Yet there I was, one Friday afternoon, chilling and rolling and chilling again and baking blind, all because this pie looked, once I’d made the pastry, like something completely simple and very very delicious. Reader, it was. I’ve made it three times already which tells you all you need to know. NB: the recipe in the book serves six so I have scaled it down slightly but, to be honest, the amounts you require will depend on whether you eat it on its own, or as a side and the size of the chicory you can find. The ones I get are quite small so I can eat two heads for dinner, hence I’ve made this with four for two people (which might be enough for four as a side). If you can find large ones, you may need slightly less. 1. If using slices of bread, trim off and discard the crusts, break the rest into pieces and whizz to crumbs in a blender or food processor. 2. Remove and discard the parsley stalks and chop the leaves, peel and bash one of the garlic cloves and put with the crumbs in the blender. Season and blend to fine, pale green crumbs (mine weren’t that fine or that green, but still delicious). 4. Trim and quarter the chicory. Melt the butter in a heavy frying pan and heat until foaming. 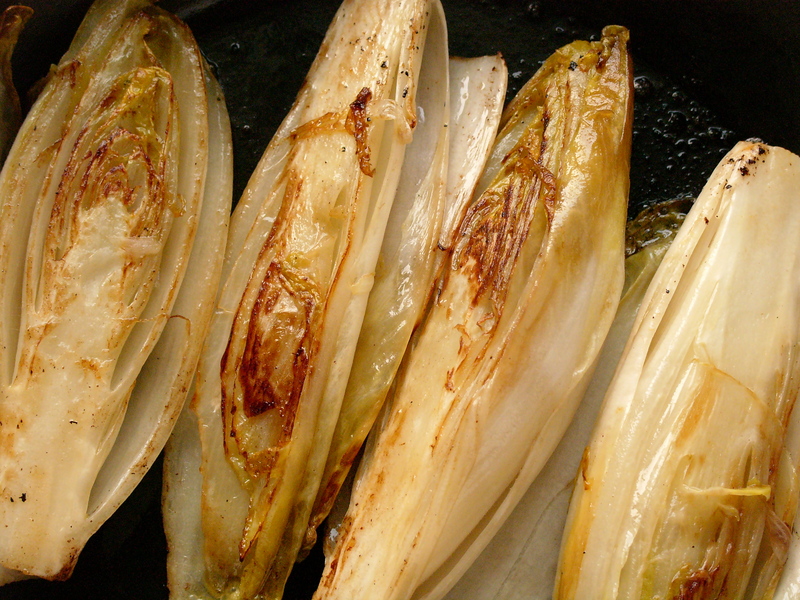 Add the chicory cut side down and cook until golden all over, turning the pieces gently from time to time. Whilst the chicory is cooking, peel and crush/chop the remaining garlic clove, pick off the thyme leaves, discard the sprigs and chop the leaves. 5. Once coloured all over (see below), put the chicory side by side in an ovenproof baking dish and season. Keep the frying pan ready for the next step. 6. Put the double cream, chopped thyme and garlic into the buttery frying pan, season and bring to the boil. Reduce the liquid by a quarter then pour over the chicory. 7. Grate the cheese over the top of the cream then bake for 10-15 minutes until the chicory is tender (test it with a skewer or knife). 8. 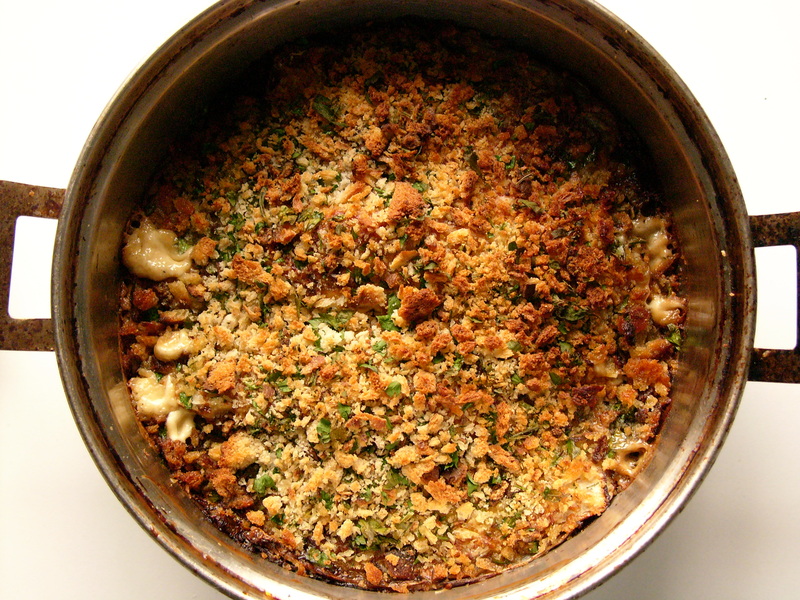 Remove the chicory from the oven, cover with the breadcrumbs and return to the oven for another 5 minutes or so until crisp and golden. This entry was posted in Vegetarian recipes and tagged 30 Ingredients, Alice Waters, chicory recipes, Elizabeth David, Sally Clarke. Bookmark the permalink.